Please note that all associations differ in number of units and assessment amounts, therefore the financial situations of various condominium associations may differ greatly from the illustration. The following illustration is to be used to outline the general scenario of a typical condominium association in financial distress. • The following Condominium Association contains 35 units and requires monthly assessments of $100.00 per unit, resulting in an operating budget of $63,000 per year. 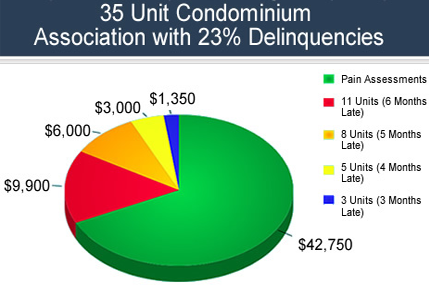 This Association has 27 unit owners that are delinquent on their condo dues, ranging from 3 months to 6 months behind. • In this scenario, the Association's annual operating budget will fall short $20,250, representing 32% in delinquent assessments. • The Association is forced to operate on 2/3rds of its normal operating budget. Imagine trying to pay your bills and live life as normal if your wages were cut by a third. The Association faces insurance lapse, termination of utility service and the aesthetics of the Condominium Association begin to suffer as vendors such as landscape providers begin to withdraw service as payments begin to cease. • The Association now finds itself in the awkward and exhausting position of the role of debt collector amongst friends and neighbors. Those who are current on their on their assessments begin to scrutinize those who are behind, blaming them for the pitfalls and decline of their once flourishing home, creating a hostile environment for all. • Forced to borrow from underfunded reserves, reserve accounts become depleted, and with the current state of the economy, the Association is denied a loan large enough to cover their operating expenses. How will Florida Condominium Associations overcome the hardship of delinquent unit owners? • Enter Foreclosure Solutions. Created with the intent of saving Florida Condominium Association from the brink of insolvency, Foreclosure Solutions provides immediate funding to Condominium Associations experiencing financial crisis, just like the association in the illustration. • In this example scenario, Foreclosure Solutions would provide immediate funding of $16,200 (80% of assessments that are up to 6 months delinquent). • Foreclosure Solutions assumes all collection efforts as well as the risk, and will subsequently pursue all debt collection from delinquent unit owners, with no hidden fees assessed to the Condominium Association. • The Association now has the cash in hand needed to resume day to day operations, does not have to worry about having a lapse in insurance policies, utilities and vendors remain paid on time, and stress and costly process of collecting delinquent assessments is now out of the hands of the Board of Directors. • End the trend of delinquent unit owners, and call Foreclosure Solutions today for a free consultation. You are only a call away from receiving the solution to your Association's financial crisis! As the economy has taken a serious downturn unit owners in numerous Condominium Associations across the state have struggled to remain employed, creating a trickle down disaster effect, mortgages are being defaulted on, association assessments are becoming seriously past due and the financial integrity of these associations are being compromised, leaving vendors unpaid and the Association Board of Directors without any options. Without the necessary income flow, Associations risk a lapse on necessary insurance policies, missing major scheduled improvements such as roof repairs and painting as well as other unforeseen emergencies such as floods. Given the current shape of the economy, going to a bank for a loan large enough to cover the delinquent assessments is out of the question. Borrowing from reserve accounts will only work for so long before those reserves are depleted, assuming that there are properly funded reserves in the first place. Enter Foreclosure Solutions. Foreclosure Solutions was created with the intent of providing necessary cash flow to Community Associations in dire need of financial relief. Foreclosure Solutions assumes the bad debt of your community allowing vital everyday operations to resume as normal. Call today for a free consultation and allow Foreclosure Solutions to be your solution to financial crisis!